The Leader's Manual is the fruit of the hard work of various parish directors of RCIA with years of experience implementing the catechumenate in their own parishes. It explains the RCIA in-depth while simultaneously giving many practical tools to implement the RCIA with ease. 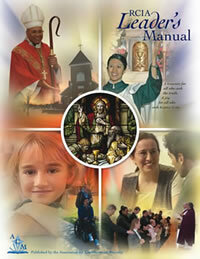 Newly published in 2007, this resource is being used in at least 2,500 parishes across the United States and has been purchased by parishes in every diocese of the United States and every province in Canada. The RCIA Leader's Manual comes with a compact disc (CD) containing many of the items in the manual in printable form such as an information-gathering form for new inquirers, parish bulletin advertisements, and sample agendas for team meetings. You will also receive the RCIA Overview Chart that folds out as well as a copy of easy reference tabs for your copy of the RCIA ritual book. To give you a good idea of exactly what you will find in the RCIA Leader's Manual, we've provided you with the Table of Contents below. The entire section of appendices of this Manual is copyable, and is also provided on CD-ROM (found in the front pocket of the Manual) to allow for unlimited printing or downloading for modification to a parish's needs. Any of the material in these seven appendices may be modified in whatever way a parish RCIA leader deems appropriate. The PDF documents on the disc are programmed to allow a user to highlight the text on-screen and move it to a hand drive, or simply to print a document with its formatting intact. The seminar handouts are not intended to be an integrated part of the preceding two sections of the RCIA Leader's Manual. Instead, they are provided for those who take advantage of the Association for Catechumenal Ministry's (ACM) Team Training and Catechist Training Seminars, or who view them in a recorded format. These highly practical handouts are also used to complement ACM's RCIA distance-education modules (to be published soon), which are designed for those who cannot attend ACM's live seminars or who do not have access to a recorded version. The twenty Team Training handouts provide a comprehensive and highly detailed walk through the three aspects (liturgical, catechetical, and pastoral) of the Christian initiation process. The seventeen Catechist Training handouts break down the work of the catechist into three parts - method, content, and themes for each of the periods of the RCIA process - providing an in-depth picture of what it means to teach for conversion, and how that teaching serves the liturgical and pastoral aspects of passing on the faith.